3.3miles (5.3km) from the Square in Ennistymon you’ll come to Kilshanny village (a pub on your right and a few houses, don’t blink, you might miss it). 1.0mile (1.6km) after Kilshanny you come to a the cross-roads. Turn left. Follow the road for 2.4miles (3.8km) and go straight through the next cross-roads. 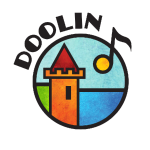 You pass Doolin School on your left. faced with an array of sign-posts and Fitz’s Bar is on your right. You are now at Fitz’s Cross in Doolin. At Fitz’s Cross you are facing the array of sign-posts and the gable end of a cottage behind them. Turn to the left. After 0.4miles (0.6km), Riverside Cottage B & B is on your right, just before you turn over the bridge into Fisherstreet. Leave Galway on the N6 in direction Dublin. When you are at the ‘Oranmore Roundabout’, the N6 to Dublin turns left. YOU DON’T. Go straight through the roundabout onto the N18 towards Ennis and Limerick. You go through Clarinbridge to Kilcolgan. At the end of Kilcolgan (after the petrol / gas station), turn right onto the N67. You pass through Kinvarra and Bell Harbour. When you come to Ballyvaughan, you are facing a T-junction. You can turn right to go the Coast Road to Doolin or you can turn left to go via Lisdoonvarna. You are in Ballyvaughan and you are facing a T-junction. Turn right onto the R477. Just follow the Coast Road. You pass through Fanore and drive on for a few more miles until you come to your first right-turn (any other right-turn you might take before that would end up in the Sea). Turn right onto the R479. After 1.9miles (3km) Doolin Church is on your left. Continue straight on for 1.2miles (2km). Riverside Cottage B&B is on your right, just before you turn over the bridge into Fisherstreet. You are in Ballyvaughan and you are facing a T-junction. Turn left, staying on the N67. There’s really nothing to explain. Just follow the windy road. Make sure to stop on Corkscrew Hill (you’ll know when you are there). But don’t just stop anywhere. There is a parking spot where you can enjoy a beautiful view over Galway Bay. Keep following the N67 and when you are in Lisdoonvarna, the Square is on your left. Turn right for Doolin. Just as you are leaving Lisdoonvarna, you come to a left-bend in the road with a turn to the right. Turn right. Immediately after the turn, there is a bend to the right, but you can go straight. Go straight. Keep going for 2.8miles (4.5km) and you come to a T-junction with Doolin Church on your right. Turn left. Go straight on for 1.2miles (2km). Riverside Cottage B&B is on your right, just before you turn over the bridge into Fisherstreet.